Be your own barista with this instant decaff Americano. Enjoy a full flavour, rich aroma and layer of velvety coffee crema. Crafted from a carefully selected blend of Arabica and Robusta beans. Decaffeinated purely, using water. Prepare your instant decaff americano in moments using hot water. 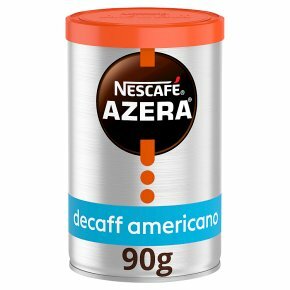 Be inspired by a brilliant coffee experience at home with NESCAFÉ AZERA Americano Decaff, our instant Americano decaffeinated purely with water. 1) Add 1 heaped tsp (1.8g) into your favourite mug. 2) Pour in 200ml of hot (but not boiling) water. 3) Enjoy your barista-style coffee. For an Espresso shot, use the same amount of coffee, but with less water.